The report from Persistence Market Research offers insights and forecast on the global welding equipment market. The report also provides a forecast on the market on the basis of regions. The forecast period taken in the report is from 2017 to 2024. The key objective of the report is to provide in-depth information on the developments in the global welding equipment market. The study also offers market dynamics that are likely to contribute to the future growth of the global market for welding equipment during the forecast period. Updates on key trends, driving factors and challenges has also been provided in the report. This helps in identifying growth opportunities in the global welding equipment market. The report is segmented into the various sections including by level of automation, by welding technology, by application, and by region. The report focuses on the overall competition in the market, which is steadily growing. The report also sheds light on the various factors that are resulting in the growing competition in the global welding equipment market. The total market share on the basis of leading manufacturers is also given in the report. Region-wise and country-wise demand of welding equipment for 2017–2024 is given along with the advancement in technology and new product launches in the global market for welding equipment. The following sections provides key segments and sub-segments in the market and their contribution for the forecast period 2017-2024. The last section highlights all the leading companies currently active in the global welding equipment market. Important details on all the companies are also given in the report along with strategies by companies to remain competitive in the market. The report has considered various aspects based on the primary and secondary research. Moreover, the region-wise performance of all the segments in the report is provided to offer an in-depth view and better understanding of the market. Quantitative and Qualitative inputs are also incorporated in the report on the global welding equipment market to offer appropriate numbers. The total value generated and the expected value contribution is focused on in the report. The current size of the global market for welding equipment forms the basis for predicting how the market is likely to perform in the coming years. Also, value and volume provided on all the key segments and sub-segments, and regions helps in identifying growth opportunities in the market at the global level. 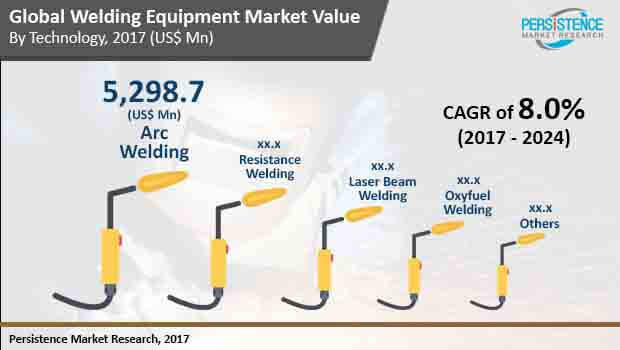 The forecasts in terms of CAGR, revenue, the volume of the products sold, and year-on-year growth is provided in the report on the global welding equipment market. The most important part of this report is the analysis of key segments in terms of incremental opportunity. This data helps in identifying the level of opportunities that a manufacturer can aim to achieve. All the potential resources in terms of delivery and sales can also be identified with the help of data and segments provided in the report. To get a clear picture on the growth and performance of the global market for welding equipment, Persistence Market Research provides market attractiveness analysis with the help of market attractiveness index in the global welding equipment market. Majority of the industrial products are manufactured using welding processes. Hence, to carry out welding process the demand for welding equipment is rising globally. However, the use of new materials in various industries has led to the requirement of innovative welding technology. Therefore, manufacturers are focusing on developing new welding machines and equipment to fulfill the growing demand and meet the need for product development on time. The concept of robotic laser welding is also gaining popularity in the global welding equipment market. With help of robotic welding, manufacturers can weld parts faster, better, consistently and safely. The demand for robotic laser welding is high in the automotive industry owing to the constant need for the perfect joining of two parts. Welding equipment manufacturers are also introducing new technologies to improve quality, safety and productivity across industries. Automation in welding equipment is being achieved by providing pre-configured weld cells. These cells allow users to adapt the welding system for wide range of operations. Manufacturers of welding equipment are also focusing on developing technologies that can help in training welding operators and save cost on training for companies. These systems deliver results by tracking motion using sensors. According to the report by Persistence Market Research, the global market for welding equipment is likely to see a substantial growth between 2017 and 2024. By the end of the forecast period, the global welding equipment market is projected to bring in US$ 19,165.2 Million in terms of value. Arc welding is the most preferred technology used in manufacturing pipelines, offshore structures, and other process equipment. Arc welding technology is widely applied for chassis parts owing to the ease of continues joining and providing high strength and rigidity of joints. Advanced arc welding technologies are also being introduced to improve productivity and efficiency. The increasing trend of weight reduction of car bodies is also driving the demand for advanced arc welding technologies. However, arc welding is still finding a large application in connecting heavy plates to build a large structure of steel. Meanwhile, compared to the traditional arc welding technology, advanced arc welding technology is boosting productivity and efficiency. Gas metal arc welding, submerged arc welding, flux cored arc welding, and gas tungsten arc welding are some of the arc welding processes being used on a large scale in different industries. Automatic welding machines are being adopted on a large scale across industries to accelerate the production process and produce a quality product. Manufacturing units in various industries are installing automated welding assembly lines to gain maximum speed in the process of welding and result in the better product. To implement automation on a large scale, manufacturers are offering robotic welding cells that are pre-configured. This is resulting in the reduction in over-welding, improved quality, and faster overall production. Various industries including automotive, and building & construction are becoming highly automated. Hence, companies are adopting automatic welding machines. Manufacturers of welding equipment are also conducting extensive research to develop welding technology and equipment that can help in welding new types of materials being used by various industries.